It's Movie Monday! Our Cemetery Walk video today is of Hillsdale United Church Cemetery in Hillsdale, Simcoe County, Ontario Canada. My great-great grandparents Isaac & Lydia Vollick are buried there but no trace of a gravestone can be found. The United Church has been converted into a home and the original church burial records have not been located. Since there are recent burials in this cemetery it seems that someone somewhere must have a record of the plots and who is buried in each. I would love to get my hands on this and find out where Isaac and Lydia are buried. Adding a memorial headstone to their final resting places would definitely be something I'd like to do. It's a very small cemetery, about 150 tombstones and I suspect that Isaac and Lydia, who died in 1904 and 1917 respectively, are in the northwest corner where the earlier stones are found. Elmavale Lance, Wed. March 30, 1904 page 9 "Hillsdale Notes": "Isaac Vollick an aged resident, died at his home on 5th concession of Flos last Friday evening at the ripe old age of 73. The remains of this pioneer settler were interred in the Methodist burying ground Monday morning. Rev. James Skene conducted the burial service." RootsTech - Are You Going? Are you ready for RootsTech 2012? I'm looking forward to it! RootsTech 2011 was so much fun and I learned a lot. I was super busy being one of the Official Bloggers (as I am again this year!) and so didn't get to as many of the workshops as I would have liked but those I did get to were very informative. The Vendor area satisfied my insatiable desire for all things technology. I think I drove my husband crazy walking around checking out all the latest toys developments. Oh and enjoying the freebies that many vendors had. Some were handouts and giveaways but others such as Ancestry.com and Bright Solid were allowing access to their subscription databases at their vendor booths. So far I've got my room booked. I'm going a few days ahead to do some research in the Family History Library. I still need to book my flight and will do that next week. I'm hoping to meet some of you in the Salt Palace Convention Center so please let me know if you're going or drop by the Media Hub! You won't regret going, it's an exciting and stimulating experience. Did you know that in 15 minutes you can photograph 30 to 45 tombstones? That's right. 15 minutes. 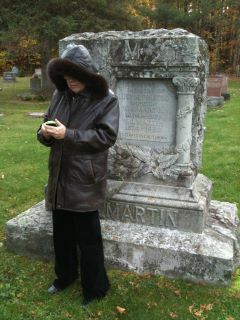 Yesterday hubs and I impulsively decided to stop and photograph tombstones in the United Church Cemetery in Hillsdale Ontario. It was a frigid day - 3' C (39' F). It was windy which made it feel even colder. We weren't sure we could stay out long enough to photograph the entire cemetery even though it is small with only about 150 stones. Hubs is much faster than me. I have some mobility issues and I use a cane. I can't walk as fast. But in 30 minutes we took 164 photos. That's an hour for one person. That's almost 3 photos every minute. Just think how many cemeteries could be photographed and put online if every genealogist donated 15 minutes of their time each week or even once a month! How many of us, no matter how busy, can't find an extra 15 minutes a month? If you want to email them to me (olivetreegenealogy @ gmail . 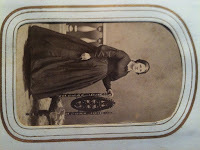 com) I will create a Cemetery Walk video of your photos on the Olive Tree Genealogy Channel where everyone can view them. If you have another site you want to donate to, that's great too! Find-A-Grave and a few other sites accept uploads of such photos. For the past six months Olive Tree Genealogy has been working on a new project to reconstruct names of passengers on ships sailing from England to Canada before 1865. I'm pleased to announce that 23 ships with the names of pauper immigrants sent from England sent by the Poor Law Union to Canada between 1836 and 1853 are now online and freely searchable. The Poor Law Union Act of 1834 was responsible for determining if impoverished individuals and their families were to be sent to the Workhouse, supported by their parishes, or given passage to a British colony such as Canada, New Zealand and Australia. As well as the newly reconstructed ships passenger lists, there are hundreds of immigrant names listed by year from 1836 to 1871. The yearly lists are individuals who were offered passage on board ships sailing to Canada, but the specific ships each sailed on are not named. There are no comprehensive ships passenger lists of immigrants arriving in Canada prior to 1865. Until that year, shipping companies were not required by the government to keep their passenger manifests. This reconstructed set of passenger lists and emigrants by year is a valuable tool for those genealogists whose ancestors left England for Canada in this time period. This new project consists of names extracted from the Poor Law Union records. More information and details on individuals can often be found by using the reference sources given on each page, and sending a request to National Archives UK. I have also included bits and pieces of extraneous detail that helps us understand the plight of these impoverished people. For example the ship Albion sailed to Quebec in 1836. Included in the Poor Law Union correspondence is a lengthy and interesting description of the passengers being held for 24 hours on arrival in Quebec. It seems the master of the ship did not receive his money (poll tax) from the Poor Law Union. So he demanded it from the passengers, who could not pay. This resulted in him imprisoning them on board until they were ordered released. Hopefully you will find an ancestor or two in this new, never before published, lists! New iPhone 4S Arrived Safely! Today is an exciting technology day! 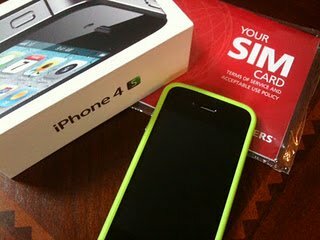 My new iPhone 4S arrived this morning and I'm heading off soon to my service provider to have them activate my SIM card. I'm going to have fun trying out the new SIRI capabilities on the iPhone 4S and am super excited about it! Since I'm upgrading from a 3GS to the 4S there are lots of new features for me. Like Facetime. A front facing camera... and I'm sure much more. To add to this day of pleasure, my new computer arrived this morning and my local tech guy came and spent 3 hours setting it up, adding a different more powerful router, re-doing my network system and making sure all my networked computers and devices were co-operating with one another. Share The Memories has some great free 2-page layouts for your digital scrapbooking needs. 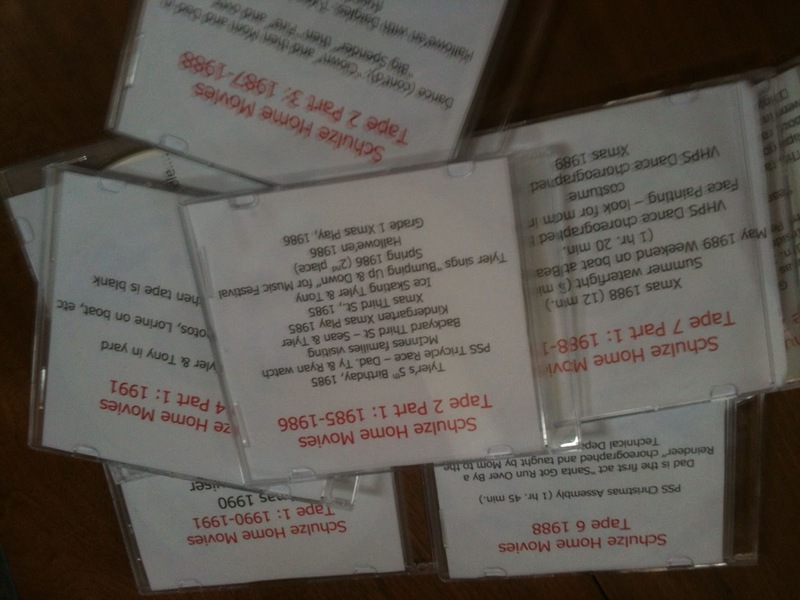 Readers who are interested can now access these free Digital Kits through Olive Tree Genealogy blog. The Free Digital Scrapbooking Kit offered this week can be seen on the left. I will be providing a link to a new Free Digital Kit next week so be sure to come back to grab that! 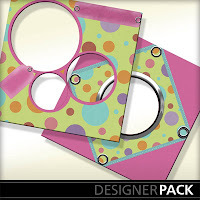 With these free kits you can start an album for photobooks, printing or on line viewing. Readers of OliveTreeGenealogy Blog can also use this special code STMMMS31969 to get a $10 discount off the purchase of the My Memories Suite Scrapbook software and a $10 coupon for the MyMemories.com store - $20 value! 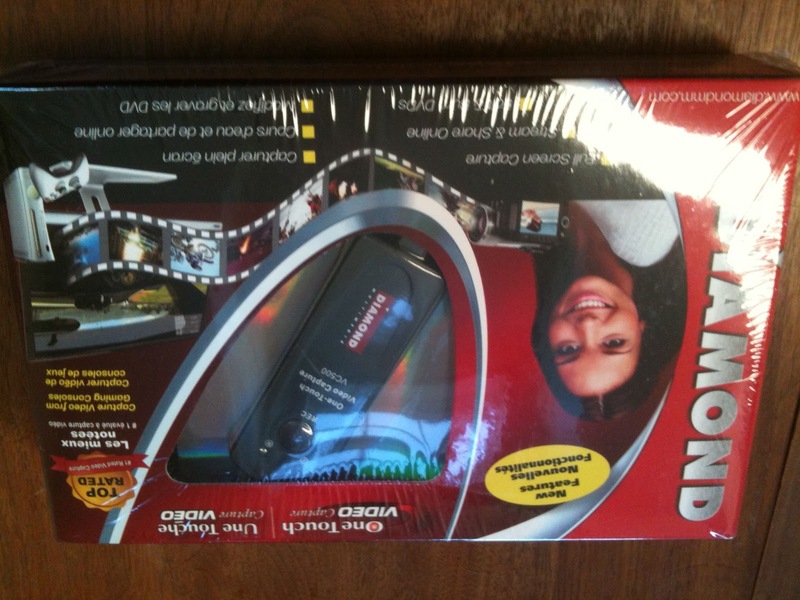 Well, I finally gave up on the idea of using the Diamond OneTouch system to capture and transfer my old VHS home movies to DVD. It was just too time consuming and inefficient to suit me! 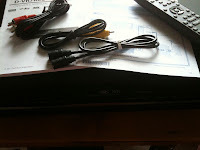 The reviews said I could pop in a VHS tape and a blank DVD, presss a button and bingo it would transfer. So I set it up (easy), and after 4 days of popping in one VHS tape after another, I now have 13 DVDs, each with 2 hours of old home movies on them! I'm so happy with this machine that I might even offer to convert my brother's old VHS tapes for him. You can see the cables that came with the machine (also the remote) I didn't need anything except the machine and the remote. 1. Hook the player to a television so you can see what's playing/being recorded. I used this to note the times and what was on the tape. That way I can make a detailed list of exactly what is on each DVD and how long each part lasts. 3. Insert a blank DVD-RW. Make sure it's RW (Read/Write) Your machine will automatically format it in preparation. When it's ready you see text "VCR>DVD" on the screen. 4. Now you pop your VHS tape into the player and press "DUBBING" That's it - sit back and enjoy watching your old home movies! 5. My DVDs were left on the default setting which gave 2 hours of tape on one DVD. You can change this (follow instructions in manual) if you want. The Dubbing stopped automatically and the VHS tape stopped too so I could simply insert another blank DVD and carry on dubbing. 6. 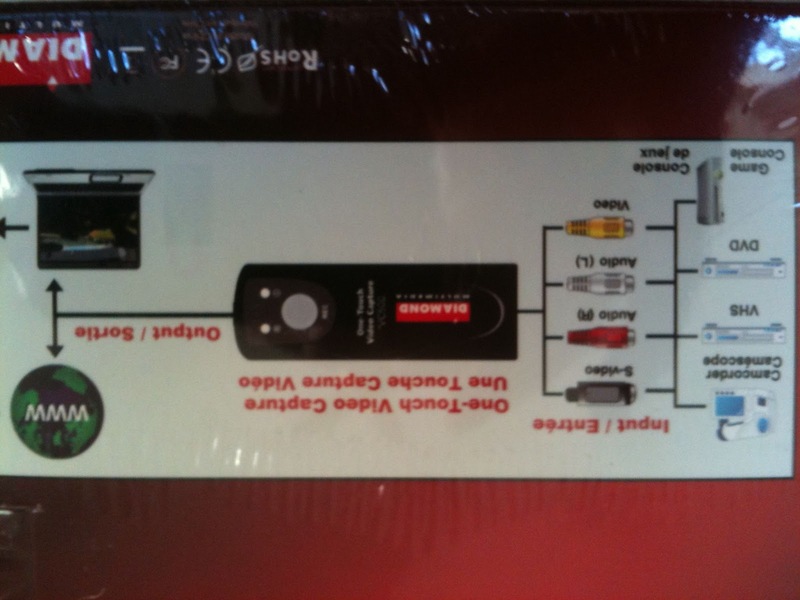 After your DVD has stopped recording, you must use your Remote to select SETUP. Then you choose the option FINIALIZE DISK. 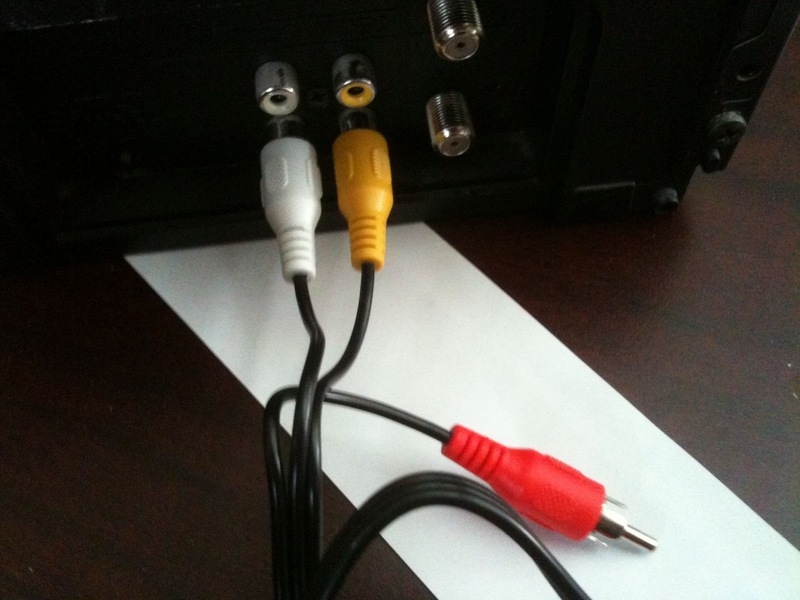 This makes the DVD playable on other VCRs. 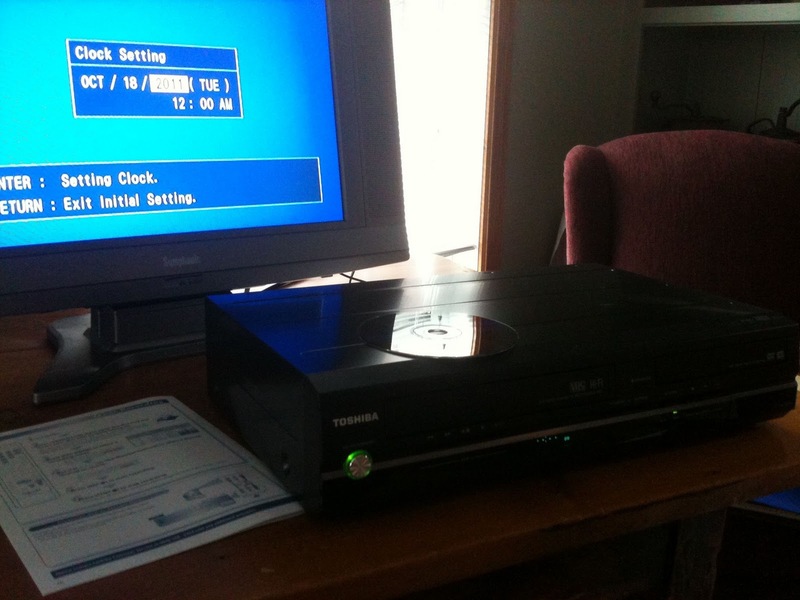 If you don't finialize your DVD you can only play it on the Toshiba you used to record it. There is a lot more you can do with this machine but I wanted to keep it simple and just get the old home movies done. My earliest is 1983 when my sons were 3 and 10 years old and they had already begun degrading. Time was of the essence! 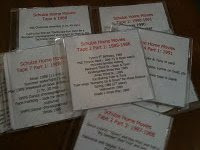 Now I need to make copies of the DVDs so that I can pass these treasured family memories on. (19 October 2011) The National Genealogical Society is seeking nominations from the genealogical community for persons whose achievements or contributions have made an impact on the field. The NGS Genealogy Hall of Fame program increases appreciation of the high standards advocated and achieved by committed genealogists whose work paved the way for researchers today. Since 1986 when Donald Lines Jacobus became the first genealogist elected to the National Genealogy Hall of Fame, twenty‐four outstanding genealogists have been recognized for their contributions. The NGS Genealogy Hall of Fame Committee elects one person to the Hall of Fame annually. Those elected are permanently commemorated in the Hall of Fame at NGS headquarters in Arlington, Virginia. The 2012 honoree will join this select group of distinguished members. This year’s selection, and the society that honored the nominee, will be feted at the 2012 NGS Family History Conference to be held in Cincinnati, Ohio, 9-12 May 2012. Nominations for election to the Hall of Fame are made by genealogical societies and historical societies throughout the United States. · A nominee must have been actively engaged in genealogy in the United States for at least ten years, must be deceased for at least five years at the time of nomination, and must have made contributions to the field of genealogy judged to be of lasting significance in ways that were unique, pioneering, or exemplary. · Nominations for election to the Hall of Fame are due by 31 January each year. Official nomination forms are available from the Awards & Competitions section on our website, http://www.ngsgenealogy.org/cs/awards_competitions, or by contacting the National Genealogical Society via postal mail at 3108 Columbia Pike, Suite 300, Arlington, VA 22204‐4304 or by phone at 800‐473‐0060. The National Genealogy Hall of Fame is an educational project in which the entire genealogical community is invited to participate. Affiliation with the National Genealogical Society is not required. To see a list of previous inductees, please visit the NGS Genealogy Hall of Fame Members section on our website. WW2 American Soldiers Dog Tags - Families Found! Great news! Families for two of our WW2 dog tags that belonged to American soldiers have been found! Readers will recall that in September Olive Tree Genealogy posted about a found dog tag for American Soldier James. F. Courtney. His dog tag was found in a house in Normandy. 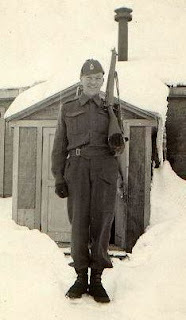 Well, I'm pleased to say that my readers found James' grandson (also a soldier) and contact has been made. The finder in Normandy has been asked for photos of where the dog tag was found and we hope a photo will be taken when the tag is received in United States by family members. I'll keep you posted! Samuel Loftus' WW2 dog tags were found by John of The Two Terriers Blog. Names and addresses of Samuel's son and daughter were found. I passed these on to John and he's written a letter to the son, who runs a jewellery store in Pendleton Oregon. We are all anxiously waiting for his response. I also hope for photos so watch the blog for more details. A big thank you goes out to all the Olive Tree Genealogy blog readers who jumped in to hunt for James and Samuel's families and especially to Becky who never gave up! Another happy ending as the result of great team work! 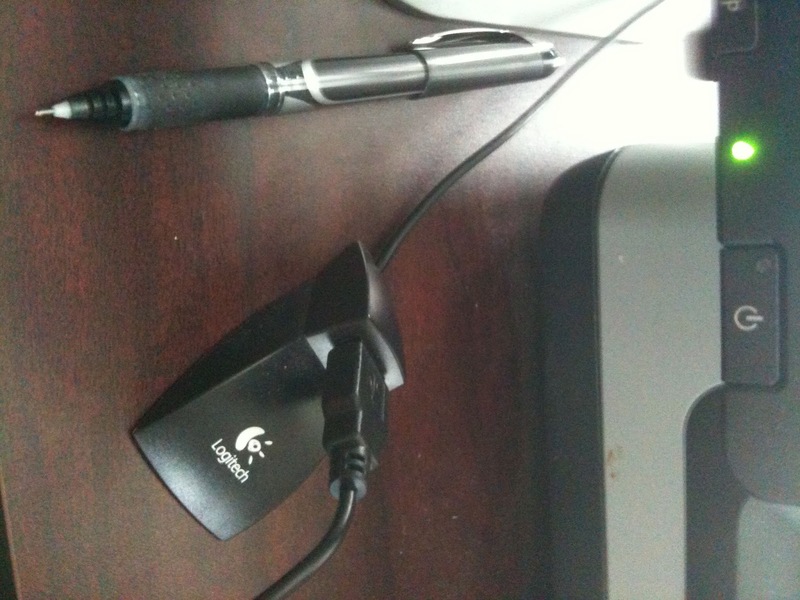 One of the things I love about my Flip-Pal Mobile Scanner is the ability to sit on the couch and scan photos. After sitting most of the day at my main computer I want a change. So my evenings are perfect for relaxing in a comfy chair or on the couch with my Flip-Pal Mobile Scanner on my lap. It's small. It's so light I'm hardly aware it's on my lap. Yesterday I spent some time documenting one of my Civil War Era Photo Albums that I buy and then put online on Lost Faces. After I take camera shots of each page of the intact album, I carefully remove the photos and begin scanning them front and back. With my Flip-Pal Mobile Scanner I can watch TV at the same time, or sit on the couch, which is much more comfortable than my computer chair. Because I'm scanning CDVs and tintypes I can scan two at a time. When I transfer the scans to my computer (easy using the Flip-Pal USB port converter) I simply save two copies of each scan, then I open each one in Picasa (or any photo editing software) and crop the scans so I have one photo per image. It's fast, it's easy and it's fun! After I scan each photo I place them in archival sleeves and then they go into an archival binder. Then more fun because that's when I start doing research to find the individuals named in the album! The album I documented and scanned and archived yesterday turns out to be for a Quaker family named Smith Battey and his wife Ruth Aldrich who lived in Rhode Island. It didn't take long to realize what a gem this album is. It contains 31 CDVs and tintypes, including some of Smith Battey, his wife Ruth and three of their children (as adults): Thomas, Nancy and Phoebe. But I'll talk more about the Battey Photo Album another day. 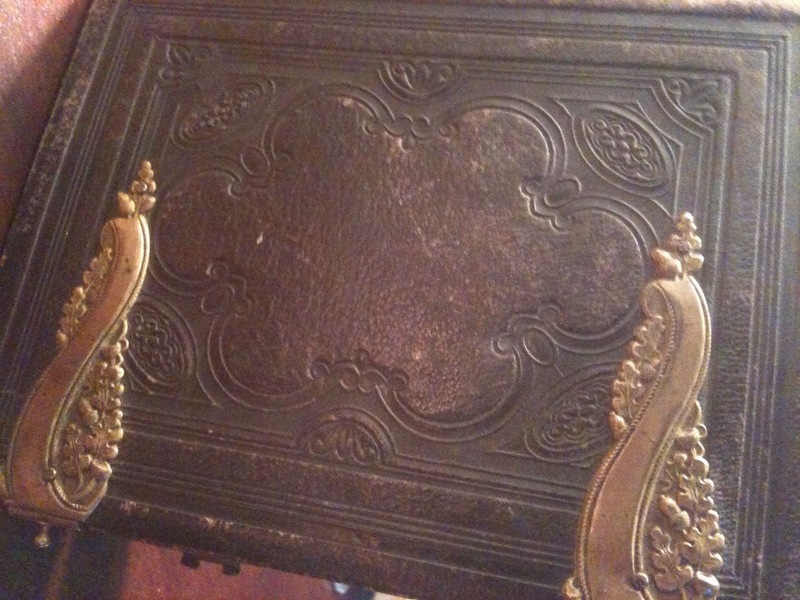 Another Civil War era photo album has been added to the Lost Faces Collection. It isn't online yet as I am still processing it. 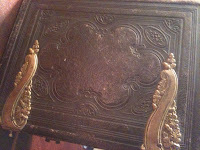 But it has some gorgeous old photos of ancestors in it! Perhaps they're yours? The album itself is in less than perfect shape. Part of the interior album pages have been torn loose from the binding and the two brass clasps that held the album closed are missing. But the album pages are in excellent condition (often they are torn or pulled loose) and the photos are very nice. My first step was to go through the album page by page and take a photo of each page with its photos intact. That helps me preserve the album's integrity and positioning of each CDV or tintype. I've just begun carefully removing the CDVs and tintypes to scan them and to see what is written on the verso (back) of each photo. I mark each photo on the reverse (in pencil) with the designation I've assigned for the album, and the number as it appeared in the album. In this case I've assigned MI (for Michigan) and am adding a sequential numbering system to each photo as it is removed. Usually I assign a 2 or 3 letter designation referring to the surname found most often in the album but this album doesn't have a clear surname "winner". So my choice of Michigan is based on the faded inscription inside cover and the location where many of the CDVs were taken. 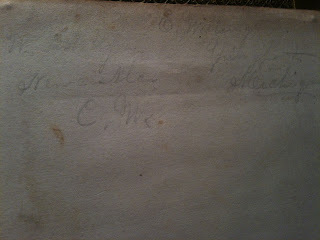 It took me quite awhile to decipher the faded writing on the inside front cover. After making it darker and enlarging it on my photocopier (I'd also tried scanning and enlarging) I was able finally to read bits and pieces - such as Newcastle; C. W.; W. W. ......; Springforth; Michigan; ... Wellington. But it made no sense until it dawned on me that it was two names and addresses! The first is W.W. Tamblyn? and under that name, indented, is the word Newcastle. Under that, also indented, is C. W. which usually means Canada West but in this case I'm not yet sure of the meaning. Beside that name is E.? Wellington. Under that, indented, is Springport. Under that, indented, is Michigan. And this is what I love about these albums and genealogy research! I mulled over the W.W. Tamblyn and Newcastle. There is a Newcastle in Ontario which was at one time in the early 1800s called Canada West (C. W.) My curiousity got the better of me and I decided to search for the Tamblyn name in Newcastle. Bingo! I found something that looks very very promising. A William Ware (W. W!) Tamblyn was born in Newcastle Canada West in 1844 to parents Thomas Tamblyn and Sarah Ware. I'm cautiously excited because in an index on the last page of the album are the names "Will Tamblyn" and "M?/Mr.? H? Ware"
An index! Yes, but I can't get too excited about it because even though 29 names are recorded, they don't appear to match the order of photos in the album. I'll be spending more time on this as I try to figure out what the starting photo is that matches the first name in the index. But for now I'm kind of excited about the Tamblyn-Ware connection. More searching using the indexed names brought me more information but I'm still working on piecing it all together. Usually it becomes apparent after a bit of searching how the individuals relate to one another - but not this time! I am finding a lot about certain names - for example the index includes a Charles W. Delbridge and a Miss Oyer. Searching on Ancestry.com and FamilySearch revealed that Charles Ware Delbridge married Lucy Ann Oyer in 1867 in Jackson Michigan. Lucy was born in Springport so that ties in with the inscription on the inside front cover. And we see the Ware surname again, but no idea how it all fits - but do I love a challenge! The Irish Family History Foundation's Online Research Service (ORS) are pleased to announce the availability of an additional 535,000 church baptismal records from the Waterford Genealogy Centre for Roman Catholic parishes in Co. Waterford. Just go to the following site and login using your existing IFHF login details. Elizabeth found an obituary for Samuel P. Loftus! It contains details of family members who are quite likely living so she sent it to me privately. I'm going to share part of the obit here so readers can see what progress is being made. Perhaps someone else can track down Samuel's son and daughter - we are so close to being able to send these dog tags back to the family! Samuel Patrick Loftus, 84, died Feb. 3, 2008, in Pendleton. The third of five children, Sam was born on Aug. 11, 1923, to Jim and Lucy Loftus on Elk Mountain. He spent most of his childhood at Imnaha. After high school graduation in 1942, Sam enlisted in the U.S. Army. He served three years in Europe during World War II. Preceded in death by his wife of 52 years in 2000, Sam is survived by his son and daughter-in-law, [names removed] of Pendleton; his daughter and son-in-law, [names removed]; two granddaughters; one grandson; and one great-granddaughter, all of Portland. John recently sent this note to Olive Tree Genealogy blog. The letters A C also appear each side of the drlled hole. Can anybody help return the tag to the family? My readers have had great success with helping to return Dog Tags to soldiers' families. Help is needed with Samuel Loftus now. Readers of Olive Tree Genealogy blog might recall that I finally took the plunge and bought a device to capture old VHS tapes and burn them on to DVDs. Well, I'm still struggling with the whole process but I am really enjoying watching bits and pieces of the home movies we took back in the 1980s! So far I've watched my youngest son's 5th birthday party where he asks "Can I open my presents now?" every few minutes, my oldest son reading a story called "Skindiver" (complete with actions) to his 5 year old brother, watched my youngest son's Kindergarten Christmas play, a very old family reunion that I'd forgotten we held, and many other snippets of family life when my boys were young. I've laughed, I've chuckled and I've shed a few tears. The reality is that many of the family in these videos are deceased. That's life but it is sad to see them smiling and laughing and realize they are no longer with us. But it's worth a bit of sadness to preserve the memories. So far I have managed to capture and burn almost 2 hours of tapes to DVD. Mind you I can only watch them on my computer as I wasn't able to convert them to be viewable in a DVD player but I'll figure that out eventually. For now I'm just happy to have them in digital format. It's a very long process though so I hope my boys aren't in a rush for these. I think they'll be so pleased to watch that they won't mind the wait. 4. Open EzGrabber and fiddle with settings until you find the one that works for you. 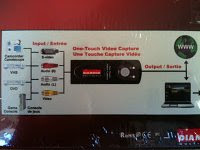 You will have to play a tape in the VCR to see what setting gives you the best quality capture. Last week hubs found a huge tub in the barn marked with my youngest son's name. So he brought it into the house for me to sort. To my surprise it was full of items I'd packed over 15 years ago, and forgotten I had! What a treasure trove - trophies awarded to my son and his deceased father, school workbooks, newspaper clippings involving either my son or his father back to 1980, stories written and put into book format from Grade 2, and other assorted treasures. I've had a fun weekend scanning most of the items and putting the originals in protective holders in my son's Family Book (a binder with original documents). 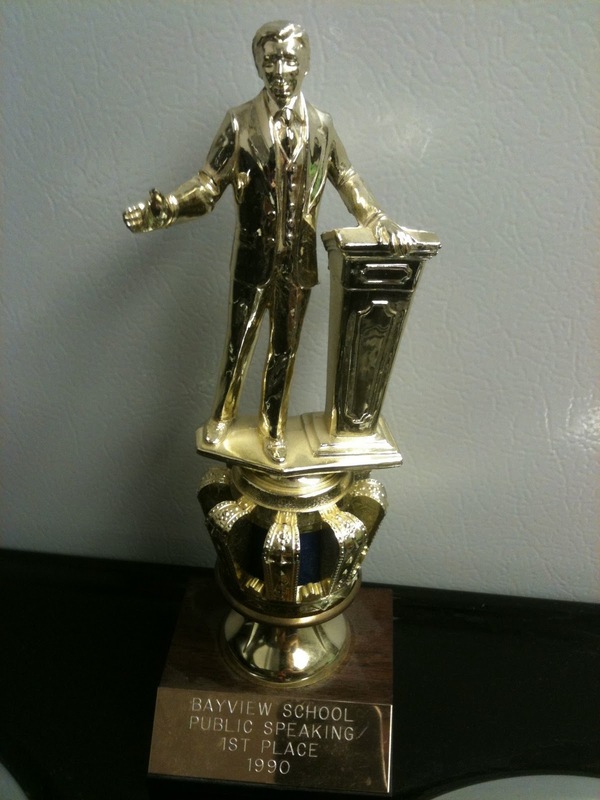 I plan to give my son the book and the trophies whenever he indicates he's ready for them. Hopefully they will be preserved, treasured and passed on to his children. He seemed pretty excited when I told him about the find. And yes, I thoroughly enjoyed re-reading his Grade 2 stories of aliens and zombies and other assorted monsters destroying earth. 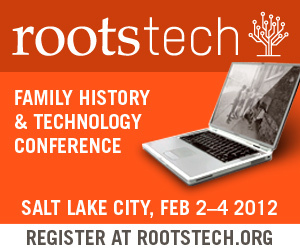 It's not too late to get the Early Bird special rate for RootsTech 2012 (Februrary 2-4). What is RootsTech? It's a terrific genealogy-technology conference held in Salt Lake City Utah. I was there in 2011 as an Official Blogger and I loved it. 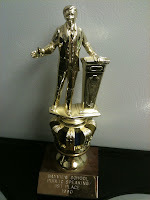 I'm very lucky to have been invited again for 2012 as an Official Blogger so if you're going (and I hope you are!) drop by the Media Center and say "hi"! The National Black Genealogy Summit will take place October 20 - 22, 2011 in Fort Wayne, Indiana. Fort Wayne's Allen County Public Library is home to one of the nation's most comprehensive collections of genealogy records, and an excellent source of documents pertaining to Black genealogy in particular. The three-day conference will feature a number of nationally-known genealogy and research experts, and a wide variety of workshops for everyone from beginners to experienced family researchers. This Olive Tree Genealogy step-by-step tutorial will walk you through how to convert your old home movies and save them to a more up-to-date digital format. Oh those old family home video tapes! Remember them? Using a video camera the size of two large loaves of bread, we took dozens and dozens of VHS tapes of our children and grandchildren. But what's happening to those tapes now? Do you even have a VCR player to watch them? 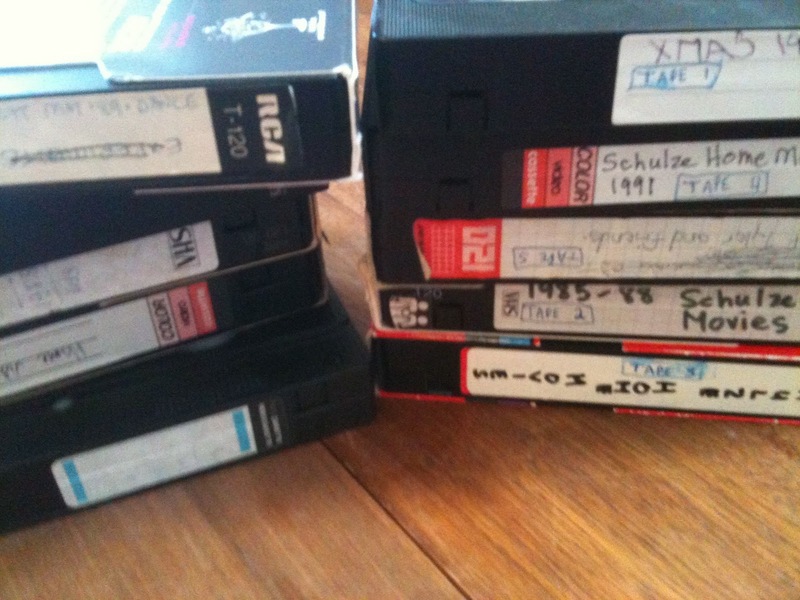 If you're like me, you have dozens of dusty VHS tapes taken in the 1980s and 1990s in storage or on a bookcase in the family room. You don't have a VCR, you can't watch them and day by day, year by year they are degrading. One of my sons has been urging me to transfer all our old home movies to digital format, preferably to a DVD so that they are preserved for a few more years. Why do I say "a few more years"? Because technology changes and a format that is viewable today will not likely be viewable in the future. Earlier this week I finally got around to ordering something I hope will allow me to transfer the old VHS tapes to digital. First I did my homework. I read dozens of reviews. I compared capabilities of different devices. I could have purchased a machine that played the tapes and burned them to a DVD at the same time. Too much money for a one-time use to suit me! 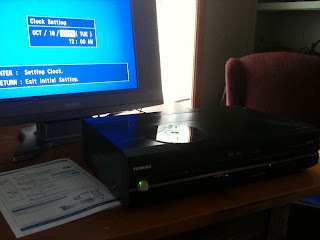 So I opted for a one-touch capture, which basically forms a link from a VCR to your computer via a USB port, enabling conversion and transfer of a VHS tape, and then a burn to a DVD. 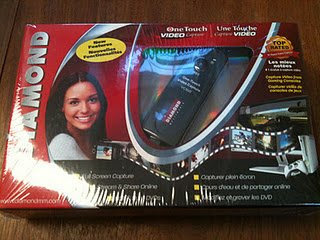 After reading many reviews I bought the top-rated Diamond One-Touch Video Capture unit from Amazon.com It arrived one day after ordering and today I plan to put it to use. 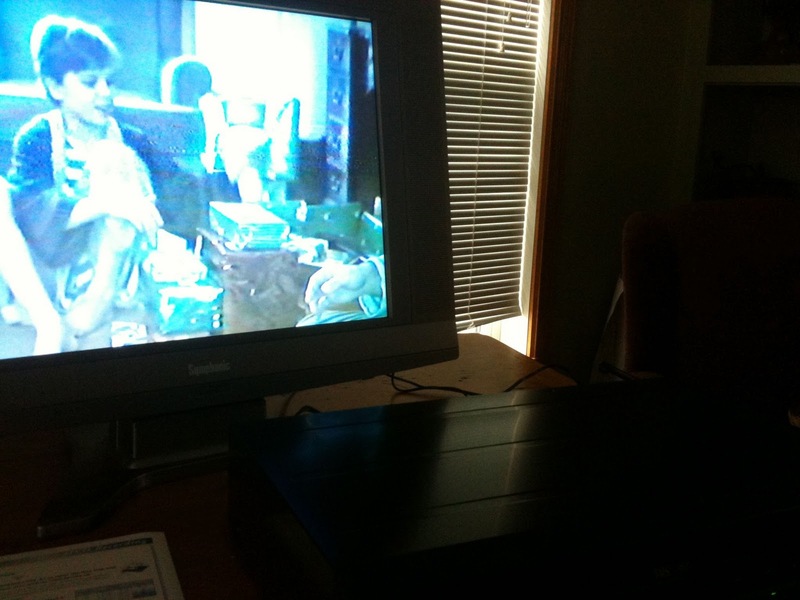 Thank goodness I have a mother-in-law who still watches old VHS movies on a VCR! 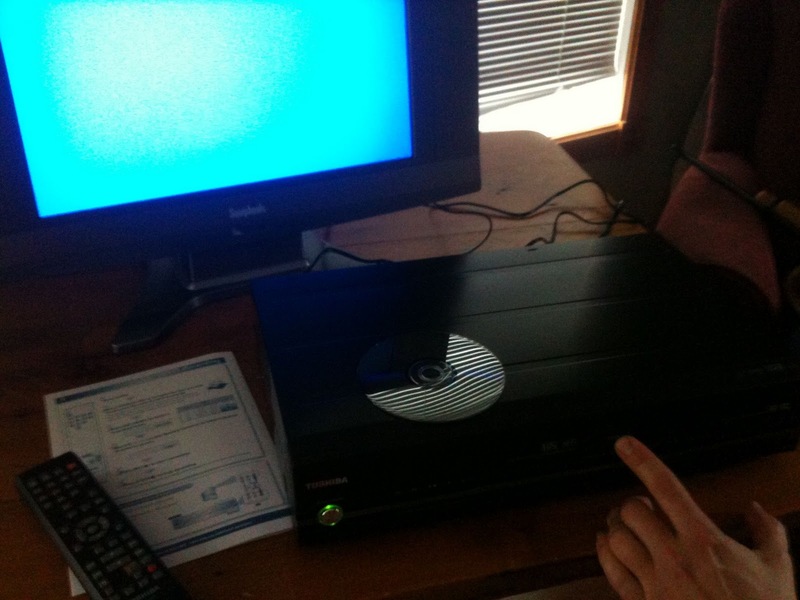 I borrowed it yesterday to make the transfer. I'll let you know how it goes and whether or not I am able to preserve and digitize those precious family memories. I'm still struggling with the whole process but I am really enjoying watching bits and pieces of the home movies we took back in the 1980s! So far I've watched my youngest son's 5th birthday party where he asks "Can I open my presents now?" every few minutes, my oldest son reading a story called "Skindiver" (complete with actions) to his 5 year old brother, watched my youngest son's Kindergarten Christmas play, a very old family reunion that I'd forgotten we held, and many other snippets of family life when my boys were young. Lübeck Census Records - These four additional Lübeck censuses have been added online, alongside the seven already on the site. Ireland Birth, Marriage and Death Records - Civil registration of all births, marriages, and deaths in Ireland began in 1864. Following is the Cemetery Walk of Uxbridge Cemetery that we took on Saturday, October 1, 2011. It was too cold and windy to do more but there are many more burials and gravestones in this Cemetery. These are the front gates for Uxbridge Cemetery on Toronto St. S. in Uxbridge Ontario Canada. Enter Ancestry.com 15th Anniversary Sweepstakes! You’re invited to a 15-day celebration of your story. 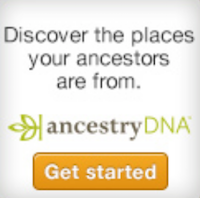 Ancestry.com is giving you FREE access to one of their favorite collections each day for 15 days. Every day through October 15th you can search free collections and enter the 15 Days of Discovery Sweepstakes. 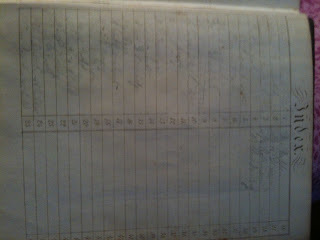 A few months ago I sent for the military records of my father's brother, Clarence E. McGinnis. I knew Uncle Clare had been in WW2 as I have several photos of him in uniform. But I never knew where he served, what unit he was in, or what he did during the War. World War 2 Canadian records are restricted. But they can be accessed and they can include documentation about enlistment, discharge, military units served with, and may also include other documents concerning medical history, medals awarded, personal evaluation reports and dental charts. Library and Archives Canada holds military service files for those who served after 1918. Their website explanation of who can access what files and how to obtain them is a bit confusing, so I'll share with you what I did. It was simple. 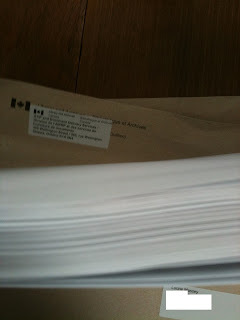 I wrote a one page letter requesting the complete military service files for [individual's name] who was born [individual's full birth date or estimated year] in [name of city/town plus county and province in Ontario] to parents [names of father and mother]. I included my uncle's death date and a photograph of his tombstone as proof of death. 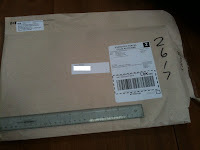 Interestingly enough they actually returned the photo to me! I should add that there is an official Application for Military Service Information form which you can download from LAC's site, fill out and mail or fax to them, but I prefer a simple one page letter. 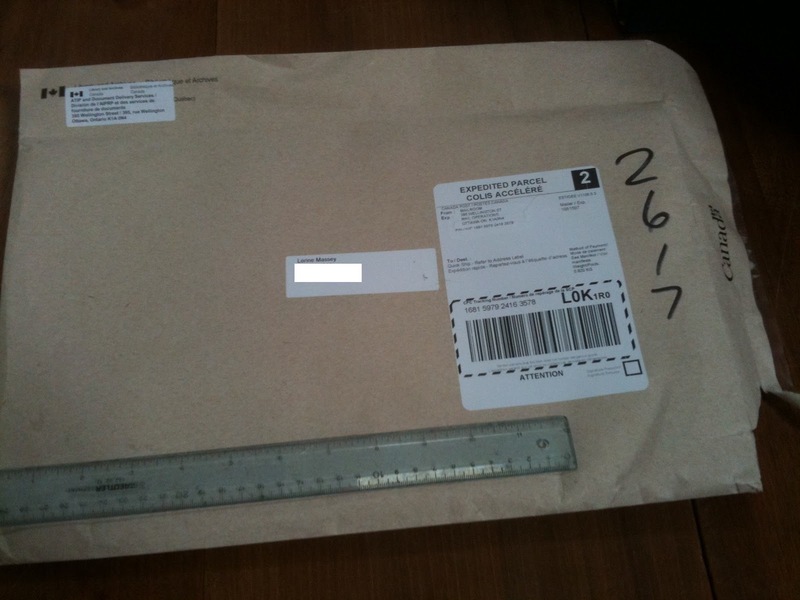 After a wait of about 5 months a very large package arrived with Uncle Clare's complete military file. I estimate there are about 80 or more pages. 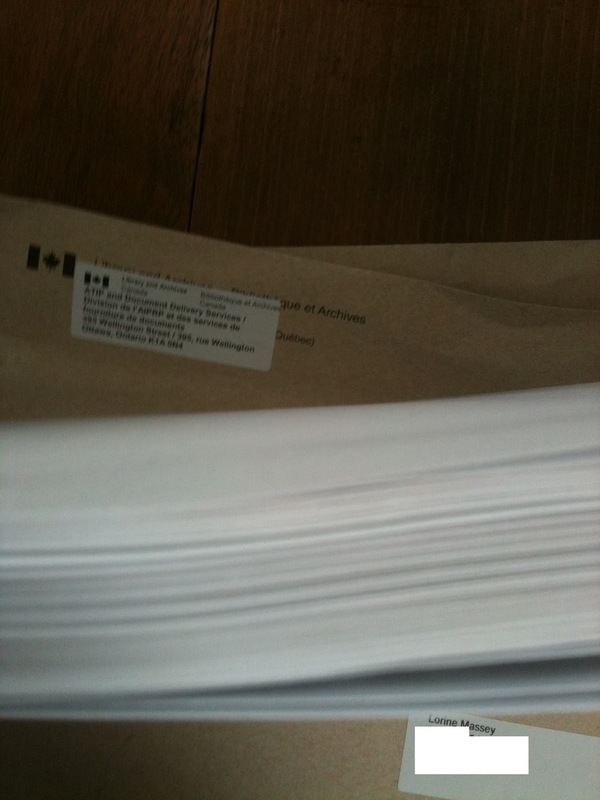 The wait was not unexpected as it is made clear on the Library & Archives Canada website that they are backlogged and requests can take up to 6 months to fill. There was a lot of interesting information in the military file for Uncle Clare - such as details of his work history prior to enlisting. It include what he was paid! I wish my dad's files had been as complete. Lots of pages to read! I am really pleased to have some more details to add to my knowledge of my uncle. I knew him quite well but he never spoke of his military service or his early years. I suppose I was too young for him to think I'd be interested. Plus he was quite old-fashioned regarding males vs females and since I was a female he'd be less likely to talk to me about what he would consider "man stuff"
But I'm really enjoying reading through his files to find out where he went during the war (to England and France) and what he saw and did during that difficult time.